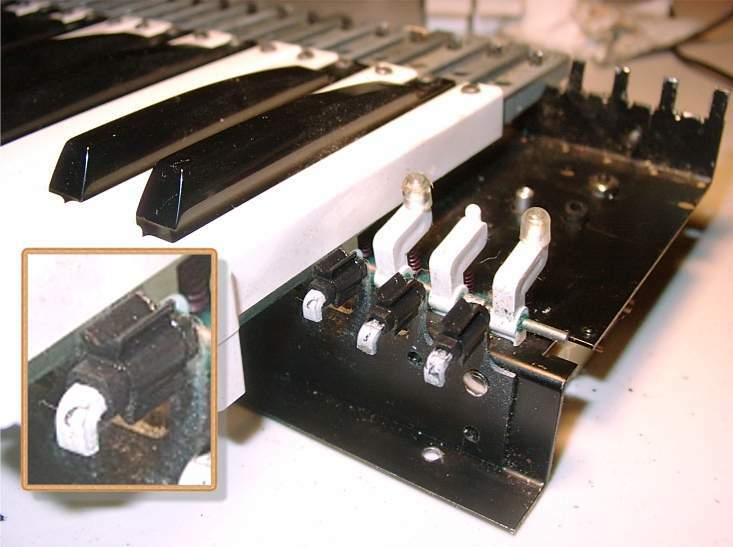 I'm looking for some of those clear plastic caps that go over the contact lever (not sure what it's called) that sits right underneath the pratt-read key (directly behind the bushings). I'm helping someone fix this and it looks like it's missing two and the keys are not making contact with the bus bar. I assumed that this helped keep the contact lever level so it would make contact. i think they're called either bellcrank caps or bell caps. either way, if you can figure out what organservice.com calls them then you can buy replacements from them (hint- email them the link to the mini photograph below and they should be able to match you with the right part as long as you say what part it is you want, what you think it's called, that it's Pratt Read, etc). they sell a pretty comprehensive selection of Pratt Read parts, great company. their P-R parts are under Conn organ parts. Make sure the wife doesn't see the charge from "organservice.com" on your credit card statement. just registered, found your posting.